You may modify this mod in any way you wish so long as you credit me and the other people who gave me permission to develop their own mods: most notably the creator of Immersive Ingestibles, Turija, and Borgiak the creator of "BRG The Gourmet". If you use the health regeneration file then there's no need to update. * Raw meat is now all properly tagged "Raw". For instance, "Rabbit Meat" is now "Raw Rabbit Meat"
* Wine is effective for Nords but was listed as being effective for imperials. That is corrected. * Alto Wine says "A fine wine made from Jazbay Grapes", accidentally removed during an update. Restored. * Removed instakill chance from drinking Skooma of any kind. I think this was a leftover effect from Requiem and wasn't intended to be in the mod. * Maintained chance of paralysis from drinking Skooma (because it's a drug) but reduced the time of paralysis from 2 minutes down to just 10 seconds. This should remain immersive. Hotfix update: Added "No Auto Calc" flag to Skooma that was creating ridiculously expensive prices. Using NifSkope I went through each mesh and ensured there are no more invisible textures. Nothing in the game should be invisible any longer. Download the latest ASSETS file only. You do not need to re-download the CORE file. Load SAFO after any mod that affects textures, such as Static Mesh Improvement Mod (SMIM) which I suspect was creating the invisible Apple texture issue for some people. Added a fully functioning patch for Creation Club's Survival Overhaul with all SAFO 2.0+ recipes and items working to restore hunger. All soups and stews can be crafted "hot" and used to fight off the cold. Download available in "Optional" section. Added missing descriptions to the active effects tab when drinking mead or wine: Stamina buff, slowed magicka regeneration, weakness to magic. Added fortify magicka buff to eating Hagraven steak. Previously, eating Hagraven would only restore 50 points of magicka. Added fortify health buff to eating Sabrecat steak. Previously, eating sabrecat steak would only restore 10 points of magicka. Added fortify health buff to eating raw sabrecat sausage. Previously only restore magicka was included (which is now removed). Added fortify health buff to eating raw skeever sausage. Previously only restore magicka (now removed). Added fortify health to cooked sabrecat sausage. Added fortify health to cooked skeever sausage. Added Resist disease to drinking tomato juice. Previously only had 20 points of restore magicka. Added fortify health to drinking watermelon juice. Previously only had 100 points of restore stamina. Pumpkin soup lasts 360 seconds now. Boiled Scaly Pholiota now amplifies the raw buffs of eating the ingredient. Boiled skeever tail now amplifies the raw buffs of eating the ingredient. Eating ground cheese no longer restores health. Instead it provides 15% poison resist for 300 seconds, while adding 100 points of stamina and magicka over 10 seconds. Eating raw spider will now cause 1 point of health damage per second for 300 seconds regardless of race. Sugar no longer restores health. Instead it creates weakness to disease but only very temporarily. Discontinued support for Nexus Skyrim Overhaul. Use the old patch from the optional downloads if you want to use both mods. New recipes and ingredients added in 2.0 are not supported. Updated Realistic Needs and Diseases patch and included all items added in SAFO 2.0. I need feedback on whether the spoilage of those new foods works when turned on. Updated Realistic Animals and Predators patch to now include effects for food created by the mod, as well as adding ingredients to wolves and deer added by RAP. Survival Mode Patch not updated (too much work) to include items added in SAFO 2.0. Please download optional file if you want to use Survival mode with SAFO. Updated Valdacil's sorting to include items added in SAFO 2.0. Changed rules on [Raw] tags to exclude items that do not cause upset stomach since raw foods are special in SAFO. THIS IS A MASSIVE UPDATE TO THE MOD. A NEW GAME IS SUGGESTED. Food and drinks effects prioritize SAFO buffs and debuffs with “Sanguine” blessing conditions from NSO. Added effects to special Riften drink Velvet Lachance using ingredient lore from honey, spiced wine, nightshade: Slowed stamina regeneration, weakness to damage, restore magicka but damage magicka regeneration, fortify stamina, fortify destruction and 5 points of damage health from the Nightshade. Price: 180. Added effects to special Riften drink Cliff Racer using ingredient lore from Firebrand Wine, Cyrodilic Brandy, Flin and Sujamma: Restore stamina, Fortify stamina, damage magicka regen (but not for Imperials), regenerate magaicka (only Imperials), Resist Frost, Fortify Carry Weight, Reduce Magicka (but not for Dunmer). Imperials are not affected by negative traits in the Brandy, while Dunmer are immune to the negative traits in Flin and Sujamma. Added the “drugged” magic effect to Skooma, Balmora Blue, and Kordir's Skooma. Effects last 45 seconds. Jarrin Root now damages 200 health, magicka and stamina. Damage Magicka Regen now lasts 10 seconds instead of 5. Consuming a poison bloom causes 3 points of damage per second for 10 seconds. Target is slowed by 50 for 10 seconds instead of 5. Fortify carry weight is reduced but duration doubled. Fear duration is doubled. Hawk Egg added. Resist Magic duration doubled. Magicka Regen damage reduced in half but lasts 120 seconds. Waterbreathing now lasts 25 seconds instead of 5. Lingering stamina damage lasts for 120 seconds. * Removed left over harmless fragments from Requiem to some magic effects. I used Requiem as a basis to understand some of the magic effects. For those struggling with the small fonts, you can download Legible Item Descriptions from Legendary Edition. It works with Special Edition. This mod is no longer in active development. Anybody who wishes to expand on this mod is free to modify it in any way they wish. Skyrim Alchemy and Food Overhaul (SAFO) is a large change to the way not just alchemy and food works, but the way the game is played. Inspired by Requiem Overhaul, food buffs are more important than default Skyrim and gives you an immersive reason to eat and drink. The base of this mod was created in two mods from Skyrim 32-bit: Turija with Immersive Ingestibles and Borgiak with BRG The Gourmet. The idea was to make food mean something more than simply a roleplaying reason. Since Bethesda didn't include a reason to eat or drink beyond turning food into a small health potion, this mod (which integrates Immersive Ingestibles) attempts to get people to eat for the benefits it provides. What are the exact changes you've made? Like Requiem, alcoholic beverages have benefits and hazards. You won't become incapacitated like Requiem, but you will see positive and negative side effects. As an example, Firebrand Wine restores stamina, damages magicka regeneration, resists frost, damages stamina regeneration but fortifies your total stamina. With certain drinks like mead, you'll receive an unarmed buff. The value of most potions has been reduced but the magnitude and duration has been increased. This aimed to solve two issues: First, potions wouldn't simply be sold to Belethor or left unused in your inventory. Second, potions have more meaningful effects. Some ingredients from Requiem have been added into the game from animals like wolves, mammoths, sabre cats, horkers, and bears. With Version 2.0 you can find hearts, lungs, livers, gills, meat, and eyes from every animal in the game. You can then create food from those ingredients at various crafting stations. Experience from Alchemy has been slightly reduced to avoid exploitation. Recipes have been tweaked for cooked chicken, beef, goat, horker, gorse, mammoth, pheasant, rabbit, salmon, venison, apple cabbage stew, beef stew, horker stew, venison stew, tomato soup, vegetable soup, potato cabbage soup, elsweyr fondue, braided bread, potato soup, clam chowder, mudcrab legs, bread, apple pie, chicken or lavender dumplings, cabbage stew and ash yam. New recipes have been added (from Immersive Ingestibles and BRG The Gourmet), including but not limited to, steamed mudcrab, roasted bear meat, roasted sabre cat meat, roasted fox meat, roasted mammoth meat, baked potato, grilled leeks, baked ash yam, steamed ash hopper leg or meat, boiled egg, steamed clam, stewed squash. As of Version 2.0 you can create food items from any animal, including: Sausages, cooked meat, meat pies, salted meat, boiled meat, soup, stew, stock, meatballs, and pudding. Potions and food don't instantly restore the statistics listed on the bottle or item. Instead, they take up to 10 seconds for their full effect. With Nexus Mod Manager (I don't personally use NMM but I know the majority of players do). If using Mod Organizer 2 then it's easier to check for conflicts with other mods and move SAFO above or below those mods in your left pane. 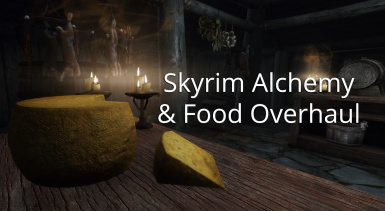 Download and install "Skyrim Alchemy and Food Overhaul (SAFO) - Assets" from the files section. If you want SAFO's unique textures to show up in the game you must select "overwrite" when Nexus Mod Manager asks you. If you notice some food ingredients being invisible inside the game it means you have a texture conflict with SAFO and another mod. If that happens, try overwriting SAFO with another mod affecting food. Examples of this can be "High Quality Food & Ingredients" (but the SAFO.esp should always go after another plugin changing food). Download and install "Skyrim Alchemy and Food Overhaul (SAFO) - Core Files and Patches". Be sure and only install the patches for mods you actually use. As well, if you select more than one patch there is a good chance that one of them will overwrite the other. For example, the patch for Realistic Needs and Diseases would overwrite the effects for Frostfall. The patch for Imperious Races of Skyrim would overwrite the patch for Nexus Skyrim Overhaul. SAFO.esp should be loaded after any mods touching food or alchemy unless I've provided a patch for it. Users would greatly benefit from using a Merged Patch and a Bashed Patch. Imperious Races of Skyrim: Compatible with patch in Version 2.2 Core files download. Frostfall: Compatible with patch in Version 2.2 Core files download. Hunterborn: Compatible but food effects have not yet been added to custom Hunterborn food. iNeed: Compatible with patch in Version 2.2 Core files download. Now includes support for all new foods added in 2.0. Ordinator: Mostly Compatible. Load after SAFO. Realistic Animals and Predators: Compatible with patch in Version 2.2 Core files download. Another Sorting Mod: Compatible with patch in Version 2.2 Core files download. XxAwesome_PotionsxX SSE: Compatible with patch in Version 2.2 Core files download. Simple Magic Rebalance: Compatible. Very minor conflicts in Fortify magic effects but hardly noticeable. Realistic Needs and Diseases: Compatible with patch in Version 2.2 Core files download. Now includes support for all foods added in 2.0. Valdacil's Item Sorting: Compatible with patch added in Version 2.2 Core files download. Animated Eating Redux: The latest version of that mod (3.0) is fully Compatible out of the box. Do not use my old patch. Survival Overhaul mod from Creation Club: Compatible with a patch from the optional downloads section. Nexus Skyrim Overhaul: Partly compatible with a patch from the optional downloads section. Does NOT include any support for foods added in Version 2.0. The leveled lists will not work without a bashed patch. Better Food Effects﻿: Mostly incompatible. Load SAFO after Better Food Effects so that this mod overwrites the changes to vanilla foods. The custom foods created by Better Food Effects will be fine. Skyrim Alchemy Fixed. Mostly Incompatible. Load one after the other based on your preference. Patch not possible. Better Harvesting: Mostly Incompatible. You will need to resolve conflicts in the leveled lists with a bashed or merged patch. Also, several food items conflict but I can't see how they would be a problem. Patch not possible. Morrowind Miscellania﻿: Mostly Incompatible. The mod overwrites every change SAFO makes to potions and also to alchemy ingredients. You can use both mods but whichever mod is loaded after the other one will win the conflicts. Patch not possible. Cooking in Skyrim: Incompatible. The two mods do the same things. This mod is NOT and never will be a spiritual companion of the vanilla Skyrim mod Complete Alchemy and Cooking Overhaul. That mod is a very unique and comprehensive mod adding tons of new recipes and a new perk system. This is a much simpler mod. Report any bugs as well. How is this different from the mod Cooking in Skyrim? That mod is awesome! I really like what he's done with creating required perks for certain recipes. It's a viable alternative to this mod. They are not compatible together. This mod allows multiple food buffs at once while CiS does not. This mod also handles a lot more than just food. Pick the one you like best and go with it. Jaxonz Positioner will make your life easier when creating Bakery Ovens, Processing Board and Tables. 1. Acerac (Tuija) for Immersive Ingestibles. It's a cool mod. 2. Borgiak for allowing me to incorporate his mod "BRG The Gourmet"